What can anyone say about corn that someone else has not long ago said better? But with that basic caveat understood, there are yet things to keep in mind. Americans are literally spoon-fed sugar from—again, quite literally—the crib onward. Some noted chef once remarked that each country’s cooking has its characteristic taste: in France, butter; in Italy, tomatoes; and in America, tin. He would have been more nearly accurate to say “in America, sugar.” There is sugar, usually lots of sugar, in virtually everything Americans are sold at the grocery store. So, it is hardly surprising that with that artificial, force-fed taste so widespread there is now lots of sugar in even home-garden vegetables, including—perhaps notably—in corn. There are sweet hybrids, extra-sweet hybrids, super-sweet hybrids, and now even “augmented super-sweet”s (and recall that the original OP type was usually called “sweet corn” to begin with). There remains, however, a not inconsiderable core of corn fanciers who believe that while a little sweetness never hurt corn, and likely helps, enough is enough. For pity’s sake, just bite into a sugar cube and spare yourself the effort of planting out corn seeds. That is not to say that we are gung ho for open-pollinated corn. Someday for sure we’ll trial it and see, but to folk other than sugar lovers the big advantage of the hybrid corns is not the sweetness as such but the fact that they hold that sweetness a lot better than OP corn. “When picking corn, walk out and run back” was the old—and, for then, excellent—advice; with OP, it is literally true that minutes, even seconds, count. (The sugars begin converting to starches the instant the cob is separated from the stalk.) But even we, who promptly freeze all our corn as picked, appreciate the breathing space that hybrids allow between picking and eating or freezing. So, to us, the best varieties are the lowest-sugar of the longer-holding hybrids. There is also the matter of color. Despite much partisanship, the bottom line appears to be that color does not affect flavor. But that is not to say that it doesn’t affect eating value, for which color (or perhaps parti-color) one prefers probably unconsciously affects our perceptions. For us, it’s yellow corn—anything else just looks like plastic; YMMV. All that said, selection of varieties is still not simple. Climate has a large part to play in dealing with this heat-loving vegetable. Our summers here are warm—quite warm—but not long. Corn traditionally is classed in three admittedly vague categories: early, mid-season, and late. We certainly cannot plant late-season corn with any reasonable expectation of success. Regrettably, experience has taught us that even mid-season corn is can be cut off by early temperature drops unless the planting time is exquisitely reckoned. We thus turn to either early types or what one might call “early mid-season” types if we want a fair shot at a crop every year. The difficulties with early corn types are two: first, too many have relatively little flavor, and that not necessarily good; and second, the ears are, not surprisingly, somewhat smaller than with later types. And even with all that said, it’s still quite a search. The cultivar we had come to fancy for reliability and reasonable quality, early-season Spring Treat, seems to be rapidly disappearing from the seedsmen’s listings with, in our opinion, no obvious successor; Fedco Seeds used to say that Spring Treat was their most popular corn—not early corn, just corn, period, mais où est les neiges d'antan? (We also liked an early type called Buttergold, but that has also become rather scarce.) Both of those were pretty early types; we now feel that with a little care in timing we can attempy mid-season types, if they’re not really deep “mid-season”. In the end, though there are many contestants, we settled for this year on a type named Bodacious RM, a more disease-resistenat derivative of plain old Bodacious. Both the original and the variant are se hybrids, the least sweetened sort of those that hold after picking. In reviewing the extensive literature on corn preferences among home gardeners, there were obviously many different types mentioned; but—and especially narrowing the field to yellow corn (just our preference), se type, and not too long a growing period—Bodacious was by a fair chalk the most frequently mentioned. We have also experimented with spacing. Advice on spacing, even in deep-dug beds, varies considerably. But will never forget the sight, back in King City, California (in the Salinas Valley), of an empty lot next to a small house, in which lot ten-foot-high corn plants proliferated densely at a spacing that looked like 6 to 8 inches. We ourselves have found that a mere 12-inch spacing works just as well as the usually recommended 16 to 18 inches; we suspect, but have’t experimented with it yet, that 10" or even 8" might work as well (and, of course, allow more crop per square foot). Mind, it is said that the closer the spacing, the smaller the average ears/stalk figure goes; but we get two ears per stalk on almost all the stalks at one-foot spacing. There are several types of corn other than “sweet corn”—dent corn, flint corn, popcorn, flour corn (dent corn and flint corn are lumped together as “field corn” because they are fed to animals), and decorative or “Indian” corn—not meant for eating off the cob; we do not grow, or discuss here, such types, but some home gardeners do grow them. Corn loves warmth, and will not germinate well or grow well in cool soil or weather. The optimum germination soil temperature is 95°, so obviously we can’t have optimum; but corn will not germinate at all if the soil temperature is below 55° F., and will likely do very poorly if it is below 65°. Waiting for 70° average daytime soil temperatures is best. Some corns can take up to three months to grow fully, but the Bodacious RM is listed as 77 days. Our nominal plan is to seed it out on June 14th for harvest around the end of August, but the soil thermometer will have to trump the calendar: if it is a cool summer, we’ll just have to wait till the soil is at least at 65°. Fortunately, we have, based on average temperatures, a good week or more of slop at the end of the growing period. Corn is a very, very heavy feeder and so needs soil that is extremely well-fertilized. (It makes a good follower, in crop rotations, to legumes, which enrich the soil with nitrogen.) Though corn is mainly shallow-rooted, a deep-dug bed is best, especially when using closer spacings. Some gardeners actually grow legumes right in the corn bed, to provide extra nitrogen to the soil as the crops grow. A common choice in such cases is one or another pole bean, planted as the Indians of the southwest did it, so that the vines climb up the corn stalks. Or you could grow a “living mulch” of some leguminous cover crop, such as hairy vetch. Corn is invariably direct-seeded; some in cool, damp climates (like the rainyside) do seedlings, but corn notoriously does not transplant well, and in our climate there’s no need whatever for transplants. Plant the seed kernels ½ inch deep in cool, moist soils, or 1 to 1½ inches deep in warm, dry soils. As we have found, spacings as close as one foot work well, even with tall, healthy corn stalks. Because corn is wind-pollinated, it is important to plant in in blocks, rather than separated rows (deep-bed gardeners always plant blocks anyway), preferably three or, better yet, four plants wide minimum in each direction. If you plant several varieties of corn, beware unwanted cross-pollination: “Supersweet varieties pollinated by standard sweet corn, popcorn, or field corn do not develop a high sugar content and are starchy. Cross-pollination between yellow and white sweet-corn varieties of the same type affects only the appearance of the white corn, not the eating quality” (University of Illinois). Cultivate shallowly to control weeds. Chemical herbicides are not recommended for home gardens. Although corn is a warm-weather crop, lack of water at critical periods can seriously reduce quality and yield. If rainfall is deficient, irrigate thoroughly during emergence of the tassels, silking and maturation of the ears. Hot, droughty conditions during pollination result in missing kernels, small ears and poor development of the tips of the ears. Side-dress nitrogen fertilizer when the plants are 12 to 18 inches tall. Some sweet corn varieties produce more side shoots or “suckers” than others. Removing these side shoots is time consuming and does not improve yields. Each cornstalk should produce at least one large ear. Under good growing conditions (correct spacing; freedom from weeds, insects and disease; and adequate moisture and fertility), many varieties produce a second ear. This second ear is usually smaller and develops later than the first ear. 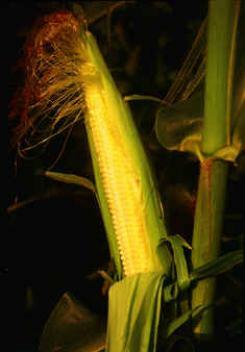 Sweet corn ears should be picked during the “milk stage” when the kernels are fully formed but not fully mature. This stage occurs about 20 days after the appearance of the first silk strands. The kernels are smooth and plump and the juice in the kernel appears milky when punctured with a thumbnail. Sweet corn remains in the milk stage less than a week. As harvest time approaches, check frequently to make sure that the kernels do not become too mature and doughy. Other signs that indicate when the corn is ready for harvest are drying and browning of the silks, fullness of the tip kernels and firmness of the unhusked ears. To harvest, snap off the ears by hand with a quick, firm, downward push, twist and pull. The ears should be eaten, processed or refrigerated as soon as possible. At summer temperatures, the sugar in sweet corn quickly decreases and the starch increases. The pollen is at the end of each tassel, not the ones coming out the top that look something like wheat, the ones hanging down. Each of these leads to a kernel of corn. Each needs to catch some pollen from another. What I’ve done is gone from plant to plant, tickling the ends of the tassels with my fingers from plant to plant. Corn needs plenty of water—particularly just before the appearance of the silk, and a couple weeks after the silk turns brown (which is the kernel-filling stage). Avoid overhead watering: wet tassels and silks may mean wet pollen, hence no pollination, hence no corn. As with many vegetables, regular strong “deep watering” works better than more frequent but more casual watering. We heartily recommend watering corn by either drip irrigation or, at the least, soaker hoses. Corn is relatively shallow-rooted, tall, and heavy: that means it is quite vulnerable to wind damage. We sometimes have truly fierce, steady winds where we are. Our first year, with rather pitiful corn that never produced anything worth mentioning (but neither did anyone else’s around here that year), we had pretty bad wind blowover; last year, with a healthy crop that yielded fairly well, we had just as much wind but no blowdown whatever. With the plants set close together—and thus more mutually supporting—one can try without bracing—but an ounce of prevention is worth a pound of corn (or something like that). Some people like to stake strong rods at the corners of their corn blocks and run twine between them as a sort of support fence, and it can only help. Keep in mind also that critters love corn, and corn seed, too. Make sure that your seed is very thoroughly protected from both four-legged and winged scavengers; if you use row cover, make sure it is solidly pinned down along every inch of its perimeter, and keep it in place till the growing stalks start to seem constrained by it. Once stalks are fairly well along, birds become less of a problem; if you keep your entire garden decently fenced, you should be keeping out anything able to attack an entire mature corn stalk (voles aren’t in for this). But check daily for possible incursions, and if you detect any act at once. As for insect attackers, Dipel is an organic product, basically a Bt spray, that handles many of the insect pests of corn. Corn readily freezes, so you can enjoy your harvest all year round and all year long. As to how best to cook corn, whatever you do don’t boil it. Boiling is a pretty horrible way to treat almost any vegetable, and especially the Queen of Vegetables. Corn is a cereal—a grass grown for its seed—from the Gramineae family, which includes essentially all of the world’s cereal crops. More than perhaps any other vegetable, corn has been radically altered by human cultivation from its native form, and indeed could not exist in its modern form without humans to grow it. The ancestral form of today’s corn was a wild grass called teosinte, which was quite a bit different from modern corn: its kernels were small, and not placed close together like kernels on the husked ear of modern corn. Its place of origin is believed to have been the Mexican plateau or the highlands of Guatemala. Fossil pollen grains of teosinte have been found in drill cores of lake sediment beneath Mexico City, which sediments could be as much as 80,000 years old. Apparently, on teosinte, each individual kernel was covered by its own floral parts as are the kernels of oats and barley, and in consequence the cob readily broke down into small segments (which may have been what allowed teosinte to survive as today’s corn could not in the wild). The husk and cob as we know them today were developed from wild varieties by the native population of the Americas. From Mexico, corn spread north into the Southwestern United States, and south down the coast to Peru. About a thousand years ago, Indian peoples migrating to the eastern woodlands of present day North America brought corn with them. When Jacques Cartier visited the village of Hochelaga (now Montréal) in 1535, he noted extensive corn fields; Champlain found corn growing in the area of Georgian Bay in 1615. Archeological studies have found that corn was grown near Campbellville, Ontario before A.D. 1200. Corn was unknown outside the Americas until the first Europeans to land found it and brought back samples. For reasons whose educing is better left to others, cornfields have assumed a mythic quality in American culture (witness Field of Dreams. A peculiarly popular manifestation of that quality is the corn maze (it’s a pun, too). It was last modified on Tuesday, 29 January 2019, at 05:01 EST.